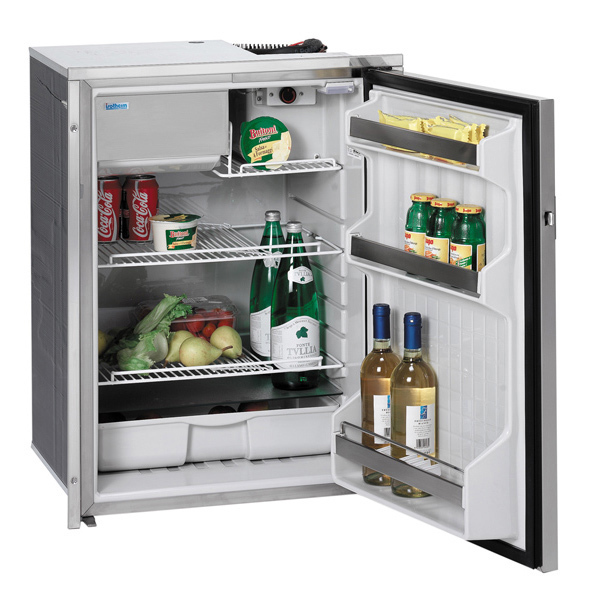 Cruise 130 refrigerators offer large capacity and accept AC/DC input to operate on all common power sources worldwide. Designed for dependable service in tough marine environments, the Cruise line features nearly silent Danfoss compressors with low power consumption and the ability to operate at up to a 30° angle of heel. Interiors easily hold larger bottles with adjustable holders and cradles to keep containers secure and upright. All models include an installation frame and interior light. All models, unless noted otherwise (see specifications below), accept 115V/230V AC and 12/24V DC input for operation on all common power sources worldwide. Each CR-130 model includes two adjustable shelves, a crisper and a deep door with three shelves. For a custom look, door panels can be removed and replaced with a panel of your choice (purchase separately) to match your boat’s decor. Two-year warranty on parts; Five-year limited warranty on compressor. For general help in selecting refrigeration for your boat, see our West Advisor "Selecting Refrigeration for Your Boat", located under "Advice" on this page. For detailed dimensions, see the Cruise 130 Dimensional Drawing. For installation, see the Cruise Refrigerator Installation and Operation Manual.